When I was still in my late teens, in the late 1960s or the early 1970s, the first pub in Lichfield I ever had a drink in was the Prince of Wales on Bore Street. It was then a well-loved community pub, close to the corner of Bore Street and Saint John Street. Today, this former public house is in a sad state, its doors are closed and its windows are boarded up. But appearances can be deceptive, and this is a Grade II listed building. 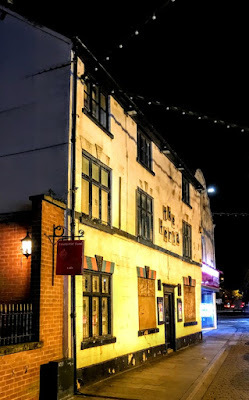 Having written in recent weeks about some lost Lichfield pubs, including the Castle Inn on Market Street and the Three Crowns on Breadmarket Street, I had promised to write about the lost Prince of Wales. Although this is an early 19th century public house, it has an earlier timber-frame structure that indicates this building may date back to the mid- or late 16th century. The building as it is seen on Bore Street today displays late 19th alterations. This is a three-storey, three-window-range building, with a stucco façade, a tile roof and a brick end-stack. There is a plinth, a first-floor sill band and a top frieze. The entrance has a doorcase with a cornice and paired two-fielded-panel doors. 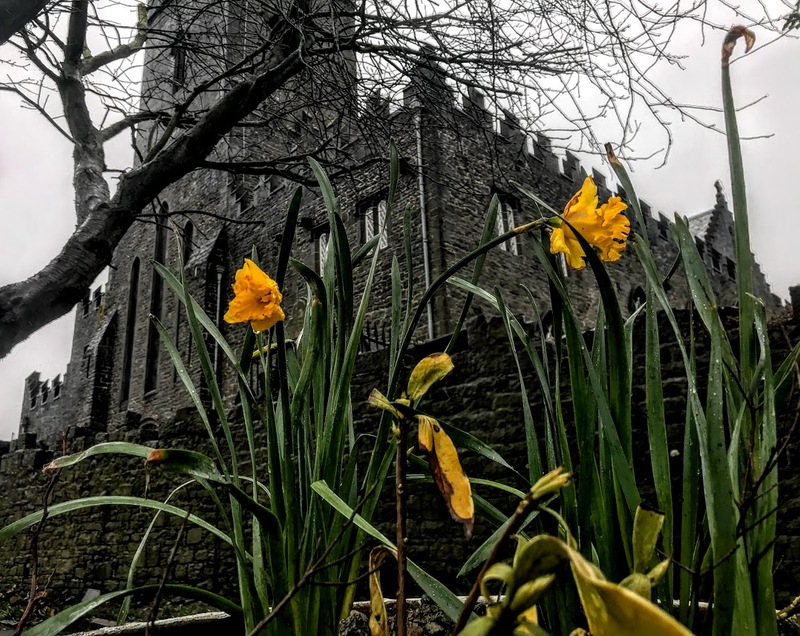 The ground floor windows have sills, and rusticated wedge lintels over three-light and four-light transomed casements with stained glass panels, although the boarding makes it difficult to known how much of this stained-glass has survived in recent years. There was rere access from a laneway that opened onto Saint John Street. There are similar three-light windows on the first floor. The second-floor windows have sills and three-light casements. An early 20th century scrolled iron sign bracket once hung over the door with a traditional sign displaying the feathers that are part of the symbol of the Prince of Wales, but it has been missing for many years. The pub was known as the Queen’s Head 200 years ago in 1818, when Thomas Whitehouse was the licensee. Later, George Sharman was running the pub from 1830 to 1834. The queen who gave the pub its original name must have been Queen Caroline, who was queen from 1820, when her husband succeeded as King George IV on 29 January 1820, until her death on 7 August 1821. King George tried to divorce her, but Caroline refused and returned to Britain to assert her position as queen. She was widely popular among the public, who sympathised with her and despised the new king’s lifestyle. Her husband barred Caroline from his coronation in July 1821, she fell ill in London and died three weeks later. There were popular public showings of grief at her funeral procession as it passed through the streets of London. Perhaps there is some historic humour in the fact that the Queen’s Head and the George IV once stood at opposite ends of Bore Street, and that the couple had married when he was Prince of Wales. When the road from the Walsall Road into Lichfield was straightened out in the 1830s, a new street was laid out and a new pub was built on the north side. 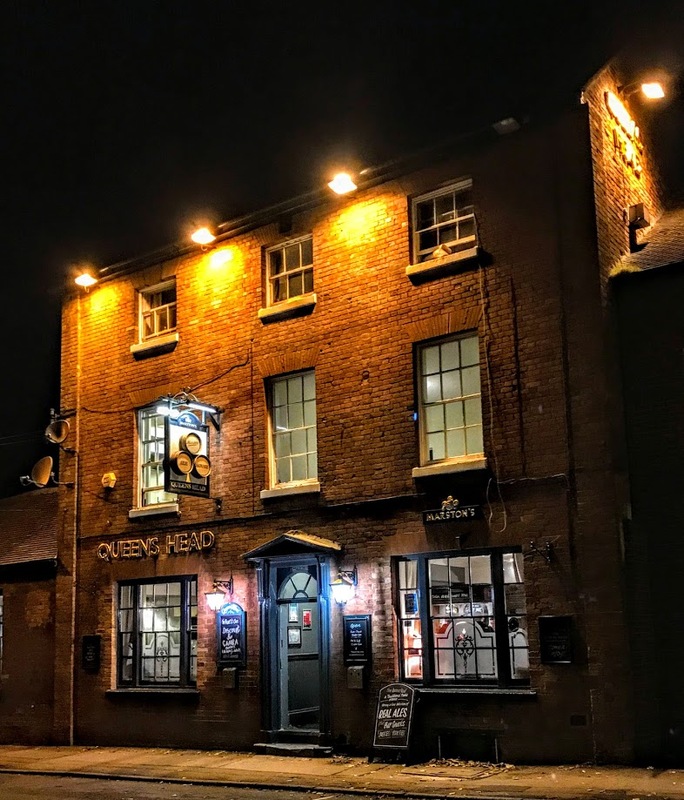 As both street and pub were completed in Queen Victoria’s coronation year, they were named Queen Street and the Queen’s Head, with the new pub taking away the name of the Queen’s Head on Bore Street. Meanwhile, under the management of William and Thomas Riley, the old Queen’s Head on Bore Street became the Turf Tavern in the 1840s, and it kept this name until the 1860s. 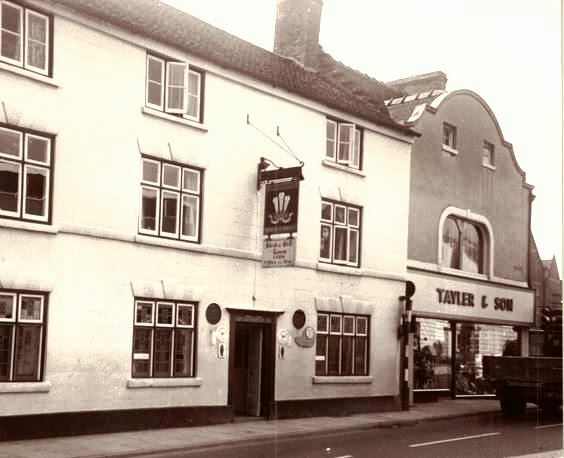 The Turf Tavern then became the Prince of Wales in 1868, when it was taken over by the ffrench family, who managed the pub for about 30 years. The Prince of Wales at the time was the future Edward VII. In 1890, the Prince of Wales Inn on Bore Street was on a list of tied houses in the Lichfield and Tamworth area bought by the Lichfield Brewery Co Ltd from the Old Lichfield Brewery Co Ltd. Throughout the 1950s, 1960s, 1970s and 1980s, the Prince of Wales remained a traditional local pub, and it was a meeting place for a variety of local organisations, including football clubs, darts teams and ex-service groups, and with Christmas parties. But in recent years these premises have suffered a series of non-traditional name changes and lost its reputation as a traditional ‘local.’ It was renamed Piper’s when it became a piano bar in the 1990s. Other names included Chameleon until 2005, and then San Sero, when it was a tapas bar. The last name before finally closing was the Feria – a name that has remained on the façade since the doors closed for the last time. Last year [August 2017], a photograph of the Prince of Wales and Bore Street taken around 1900 featured in CityLife in Lichfield in ‘A Window on the Past, Wish You Were Here …’ in a collection of nine photographs and old postcards. Sadly, this once bustling pub has been derelict and boarded up for a number of years, many of the features that resulted in its listing as a Grade II building are in danger of being lost, and memories of the community life once celebrated at its bar are fading. This is one of the traditional stations that does not recall an event in any of the passion narratives in the four Gospels. However, Ken Thompson has made this a Biblical scene by linking it with the Last Supper and more particularly with the story of Christ’s agony in the Garden of Gethsemane. The angel with the filled cup in Station IX, and the chalice that is seen again in Station XIII, recall both the Last Supper and Gethsemane. He came out and went, as was his custom, to the Mount of Olives; and the disciples followed him. When he reached the place, he said to them, “Pray that you may not come into the time of trial.” Then he withdrew from them about a stone’s throw, knelt down, and prayed, “Father, if you are willing, remove this cup from me; yet, not my will but yours be done.” Then an angel from heaven appeared to him and gave him strength. In his anguish he prayed more earnestly, and his sweat became like great drops of blood falling down on the ground (Luke 22: 39-44). The parallel accounts, in Matthew 26: 36-46 and Mark 14: 32-36, do not mention the visiting angel. There are still signs of hope in this panel: the daffodil blooming in the bottom right corner, and the green shoots on the branch in the top left corner (see Mark 13: 28). Tomorrow: Station 10: Jesus is stripped of his clothes.